After World War II, Tatra found itself stranded behind the Iron Curtain. Hans Ledwinka was accused of collaborating with the Nazis and was imprisoned from 1945-51. The T-600 was introduced at the 1947 Prague Auto Salon. After World War II, Tatra’s chief designer was Julius Mackerly. He used many elements of the T-87 to design the T-600. You will notice that the T-600 is a slightly smaller, more economical T-87. The engine is a flat 4 cylinder, air-cooled engine instead of the T-87's V8. While the T-87 can maintain a higher top speed, the T-600 is easier to drive because of its lighter weight. From 1947-51, more than half of the Tatraplans produced were exported to countries all over the world. 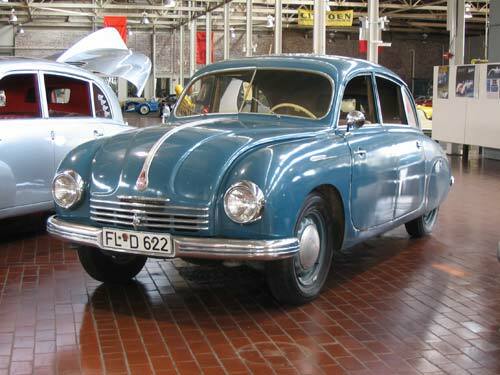 In 1951, production moved to Skoda where all the cars built were for export. Until production ceased in 1952, no luxury cars were produced in Czechoslovakia.